Preheat oven to 100°C/200°F. For the sesame marinade, mix half of the olive oil with the soy sauce, tomato paste, sesame seeds, and lemon juice in a small bowl. For the Parmesan-chili marinade, mix remaining olive oil, chili powder, and paprika in a small bowl. Grate Parmesan into the bowl and mix. 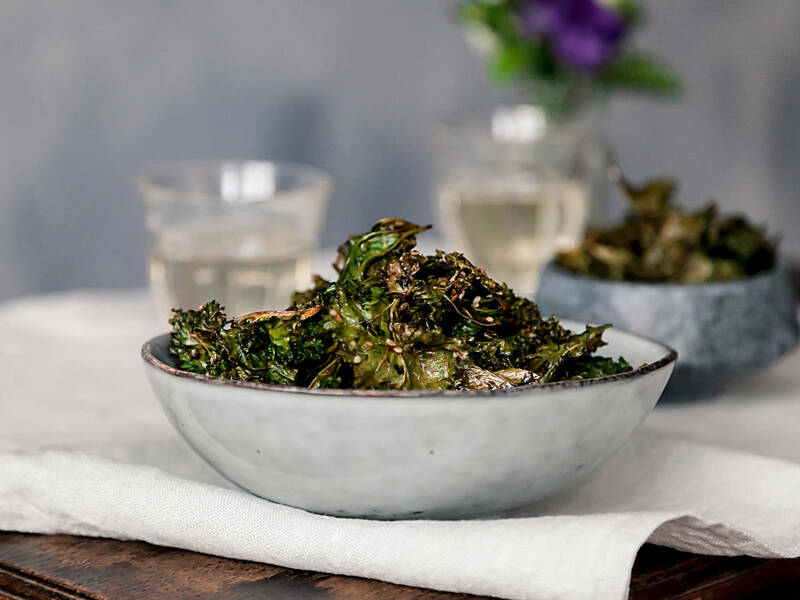 Remove kale leaves from stem, tear into bite-sized pieces, wash, and dry completely. Divide kale into two bowls, add one bowl of marinade to each, tossing until kale is fully and evenly coated. Spread the kale evenly on a parchment-lined baking sheet in one layer. Bake at 100°C/200°F for approx. 30 min. or until kale is crispy and slightly brown. Remove from oven and allow to cool completely. Enjoy!